1; Global stocks were mostly higher on Tuesday after the White House signed a temporary agreement with Mexico for replacement North had achieved American Free Trade Agreement. NOTE: France's CAC 40 rose 0.1% to 5,485.39 in early trading, while the German DAX rose 0.2% to 12,561.44. Britain's FTSE 100 gained 0.7 percent to 7,630.36. US stocks should remain virtually unchanged at 27,078 with the Dow futures. S & P 500 futures rose less than 0.1 percent to 2,899. 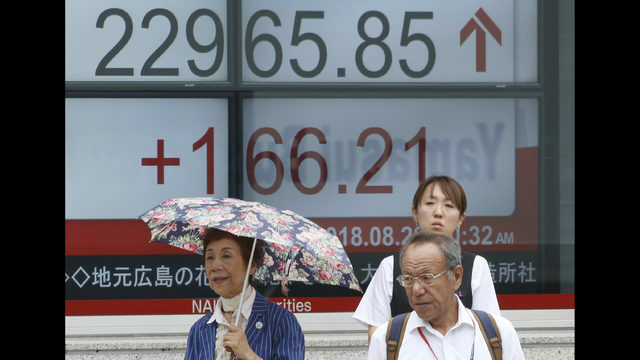 ASIA DAY: Japan's benchmark Nikkei 225 closed at 22,813.47, an increase of 0.1 percent. The Australian S & P / ASX 200 gained 0.6 percent to 6,304.70. South Korea's Kospi rose 0.2 percent to 2,303.12. Hong Kong's Hang Seng added 0.2 percent to 28,333.14 after swaying all day. The Shanghai Composite Index fell 0.1 percent to 2,777.98, adjusted for its gains the previous day. TRADE: Asian economies generally benefit from trade agreements that will boost exports to the US. The Nasdaq index exceeded for the first time over 8,000 North American FTA news, although the trade agreement is not final. The US still needs to get in touch with Canada, the third party in the agreement. THE QUOTE: "Risk appetite continues to improve with US markets, aided by recent advances in NAFTA that will more fully inspire the Asian market," said Jingyi Pan, market strategist at IG in Singapore. TOYOTA WINS: Toyota Motor Corp. shares received an advantage from the NAFTA news as the Japanese automaker benefits from free trade. The manufacturer was also invested by his announcement that it has $ 500 million in ride-hailing service Uber and will work with him to build self-driving cars. Toyota closed the morning at the Tokyo Stock Exchange with just under two percent, but sat down in the afternoon at 0.9 percent.